Evoke vintage vibes in this polished Nicholas dress. 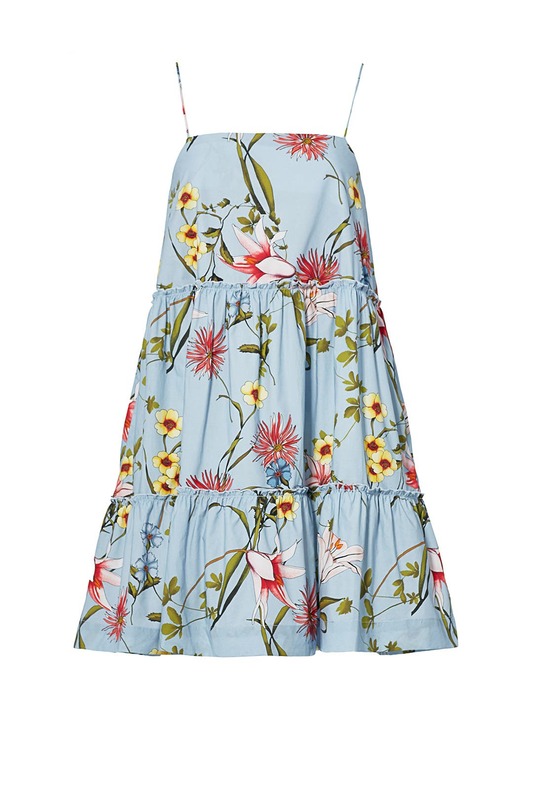 Its pastel hue and muted floral pattern make it a perfect style for spring. We love it with a slide-on wedge and the Lost City Necklace by Lizzie Fortunato. Blue floral printed cotton (100% Cotton). Sleeveless. Square neckline. Shift bodice. 33” inches from shoulder to hemline. Imported. I can only picture this dress looking adorable on an expecting mother. I use the term adorable because it reminds me of dresses I had as a child. While the pattern is very cute, The material is just ok and the fit is bleh. I loved the look on the model for a hot summer day, but it was massive (really do order 2 sizes down! Maybe 3!) and poked out so far from the profile view making me resemble a patterned trash bag. I normally wear an 8. Based on the style dress and previous reviews I rented a 6 instead. Even sizing down the dress just has too much fabric. It's a loose fitting style, but a 4 would've fit exactly the same. Didn't end up wearing. I loved the pattern but this didn't reAlly do anything for my figure. A little boxy. I would size down for sure. perfect sundress. comfortable and easy to wear. fit true to size. Lightweight and perfect for warm weather. I wore it very casually with sneakers but would be cute with a sandal or wedge. 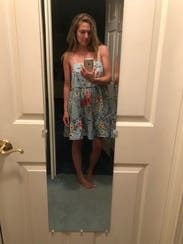 Super cute summer dress, really long straps! Very cute but read the reviews! This is suppose to be a loose Fitting dress but unfortunately it was way too loose fitting. This dress runs two sizes too big. The pattern and cut are beautiful. 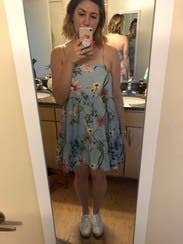 I loved this dress for vacation! I really liked the fit of it so it was breezy and comfortable. You definitely would need to wear shorts underneath! The dress has pockets which was fabulous. 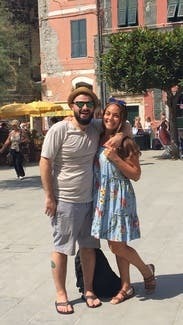 The straps run way too large so I was constantly pulling those up or adjusting those, but I wore this dress multiple times while in vacation and received many compliments. Great dress! Loved the print on this dress, but the straps kept falling off my shoulders. I would have ordered size 4, but only 6 was available at the time. Wore it with denim jacket to cover up the falling straps, added a belt to add shape, with ankle sandals. Turned out to be a cute outfit! Loved this cute little sun dress. It was perfect for my vaca on the Jersey Shore but it was way too big. I worked it once but had to wear a bathing suit underneath and it just wasn't flattering at all. This dress is huge! Beautiful pattern and color but couldn't wear as it was massive. Did not wear. Unless they sent me the wrong size the dress was huge it was at least 4inches too big. 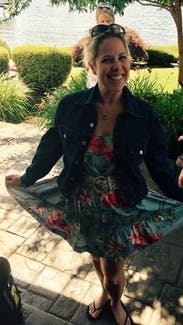 The dress is super easy to wear and the fabric is nice and light. It definitely has a boxy, oversized appeal so if you want form fitting, skip this. I wore it to run around in while on vacation. 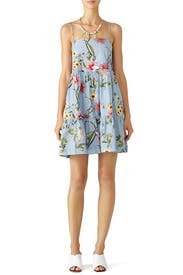 Great dress for work with a jean jacket or just looking cute out and about. 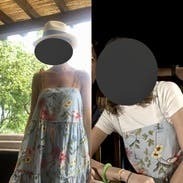 I wore this dress to your a little beach town while on vacation. It was a hot day, and the flowy shape and cotton fabric were perfect for the warm sunny weather. I usually wear a 6 or 8 in dresses and think I could have comfortable worn a 4 so size down. Cute pattern. Material is great for summer heat. Straps too long and dress itself is too big and "garbage bag" tent vibes in the cut. The fit was like a tent, it was huge. I have broad shoulders and it was still comically large all over. Cute dress. Nice fabric. Didn't wear it because it was too big. I'm 5'3" and 120. 32DD even a 2 would have prob been too big. Lots of fabric!! I LOVED this dress and tempted to purchase. Received a ton of compliments. Perfect for a day of shopping or to wear on vacation. Cool, flirty, and flattering. I'm between a 2 and 4 and feel like I could fit a 0 in this dress. The straps fit well enough, but I wouldn't have minded them being a bit tighter - and they aren't adjustable. The fabric is light but sturdy and the print is so pretty in person. 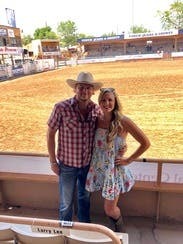 So cute for a rodeo in Colorado. A little See through and a little shirt for a 5'10" gal with boots. Perfect for wearing during the day to go to Lunch or go shopping. I brought it for our cruise and it was a perfect addition. It was a bit large but I didn't mind the oversized look. 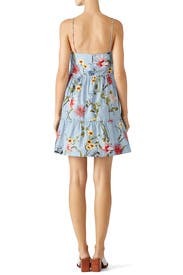 Great summer dress that I could dress up of wear to the beach. Perfect for the whole summer. Fit true to size and perfect length, even for someone who is 5'3"...didn't fall all the way to my knee. Fun and easy to wear. The print is gorgeous. Was happy I sized down to a 4. I normally wear a 6. Since the bottom is not fitted at all you want to make sure it fits snug in the chest. Paired with white sneakers. 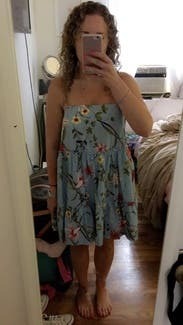 I read the reviews and sized down but there is no way I could have been out in the world in this dress without a shirt or bathing suit under it without feeling like a nip slip was imminent. Still loved it for vacation! Wore it over a swim suit during the day and wore it over a white tee one night. This was really a cute dress but it came with a broken button so I didn't get to wear on my vacation. Will rent again when it's warmer - would be so cute paired with denim or leather jacket. Very nice for an afternoon in miami. Great pattern and color. Looks great with a belt! runs big. I usually wear a size 6 but the dress was very oversized. 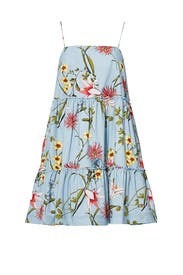 Overall, it is a fun and very pretty dress that looks feels pretty comfortable. This was disappointing. First, this dress runs large. I should have gone for an XS and not a S. Second, the dress was too short on me, I felt like a grown-up trying on a teen dress. Finally, the shape was not flattering. Based on the other reviews I ordered a 6 and normally a 8. I could have gone down another size to a 4. 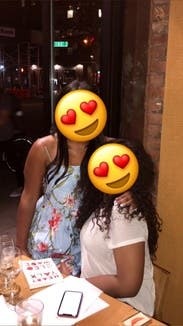 The dress is cute and I would rent again. 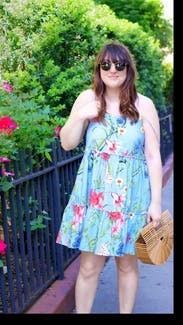 Very casual, easy to wear summer dress. It is short, so beware if you are tall. Such a cute dress. Boxy and runs big but perfect for after the beach.